It’s been well over a month since Gravity Lab 1.0 was released. Now it has received a nice update with particle trails and a solar system preset. The solar system is actually just a set of bodies with preset masses and initial velocities1. 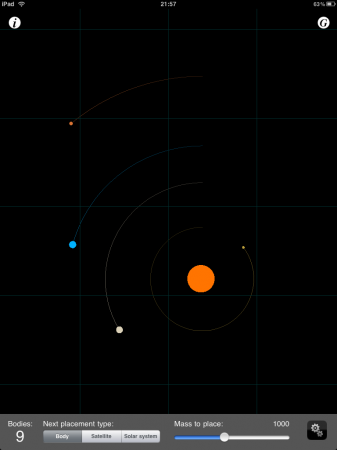 The resulting setup is quite a faithful representation of the real solar system, down to the orbiting times (i.e., the lengths of planetary years) in correct proportions. And there’s also a satellite preset. There’s also a new and interesting setting — adjustable gravitational constant, which allows you to distort the simulated universe and observe the consequences.